CHICAGO (Dec 29, 2017) - Under the leadership of U.S. Soccer Youth Technical Director Tab Ramos, 153 players have been named to rosters for the U.S. U-16, U-17, U-18, U-19 and U-20 Youth National Teams for the first ever U.S. Soccer Men's YNT Summit Camp, running from Jan. 2-11 in Lakewood Ranch, Florida. With the 2018-2019 player cycle officially kicking off at the turn of the new year, Ramos and the coaching staff will look to continue fostering a program-wide effort to develop world class players and coaches at the summit, which represents a first its kind youth training camp that will focus on integration between players, coaches and staff from the five oldest Youth National Teams, while laying the first foundational elements for qualifying the U.S. for the 2019 FIFA U-20 and U-17 World Cups. "I am looking forward to building on the success our Youth National Teams had over the last two cycles (2014-2015 and 2016-2017)," Ramos said. "This first ever Men's YNT Summit Camp provides all of our teams the opportunity to team build and to continue the development of our style of play in one location together." 2017 was a historic year for the U-17 and U-20 National Teams, as both reached the Quarterfinals of their respective FIFA World Cup Tournaments, a feat matched only by the champion of both tournaments, England. Lead by Ramos, the U-20 MNT made the first exclamation point on the 2017 calendar in March when the team won the USA's first CONCACAF Championship at the U-20 level. At the FIFA U-20 World Cup, the USA leaned on stellar performances from numerous players in an exciting run to the tournament quarterfinal where the team took eventual finalists Venezuela into extra time before exiting the competition. 2017 Young Male Player of the Year Josh Sargent, who was called up to the U-20 World Cup roster days after captaining the U-17 squad to its World Cup berth, finished the tournament with four goals to earn the tournament's Silver Boot. 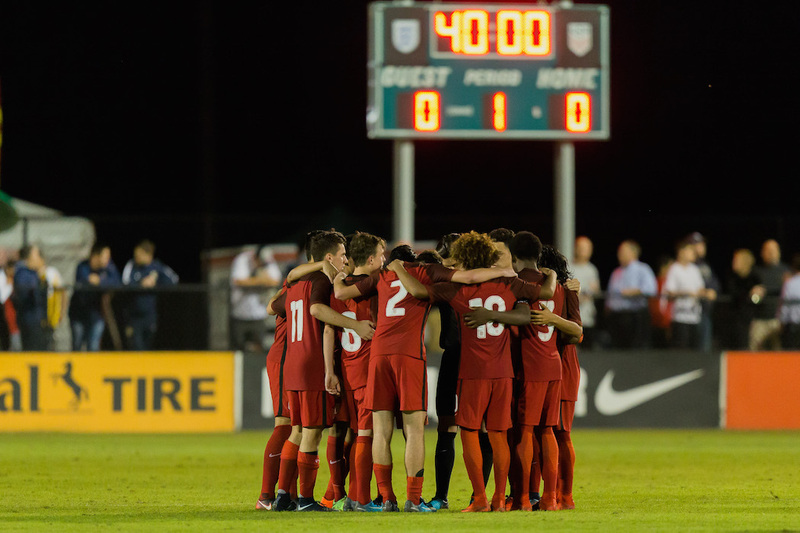 For John Hackworth's U-17 squad, the road to India and the FIFA U-17 World Cup began with a runner-up finish at the 2017 CONCACAF U-17 Championship in Panama. Despite the USA converting four of its five attempts in the shootout, Mexico converted on all five to take home the regional title. Following the match, Golden Glove honoree Justin Garces, Jaylin Lindsey, James Sands, Chris Durkin, and Josh Sargent earned selection to the tournament's Best XI. Five months later, the USA opened up its U-17 World Cup campaign with a strong 3-0 win against host India in front of a roaring crowd of 46,312 that included Indian Prime Minister Narendra Modi. The red, white and blue followed the great start with a 1-0 win over African power Ghana before falling to Colombia 3-1. The team was quick to bounce back in the Round of 16, however, as striker Tim Weah's historic hat trick helped vault the team to the quarterfinals in a 5-0 rout of undefeated Group B winners Paraguay. In the quarterfinals, the USA was unable to overcome an early deficit as it saw it's World Cup hopes come to an end against eventual champion England. 142 of 153 players have ties to the U.S. Soccer Development Academy. All 24 players called into the U-16 Boys' National Team camp roster currently play in the Development Academy. Three players have received Conference Player of the Year honors: George Bello (East U-15/16, 2017), Griffin Dorsey (Central U-15/16, 2016) and Trey Muse (West U-17/18, 2017). In July of 2017, Atlanta United FC teammates Charlie Asensio, George Bello, Andrew Carleton and Zyen Jones won the U-15/16 Development Academy national title, while then Texans SC Houston (now FC Dallas) teammates Christian Cappis and Chris Richards won the U-17/18 Development Academy national title. The Development Academy clubs with the largest representation of players called into the summit camp are Atlanta United FC and Philadelphia Union with eight players. At the end of the 2016-2017 Academy season, 25 players were named an Academy Best XI selection to their respective conferences: Brenden Aaronson, Axel Alejandre, George Bello, Nico Benalcazar, Gianluca Busio, Christian Cappis, Cameron Duke, Sam Fowler, Cameron Harper, Mason Judge, Damian Las, Richard Ledezma, Jack Maher, Nelson Martinez, Mark McKenzie, Glademire Mendoza, Trey Muse, Isaiah Parente, Josh Penn, Giovanni Reyna, Leonardo Sepulveda, Brandon Servania, Sebastian Soto, Aedan Stanley and Sam Vines. Prior to the 2016-2017 Academy season, 13 players garnered at least one Academy Best XI selection: Simon Becher, Jose Carranza, Dorsey, Chris Durkin, Jaylin Lindsay, Rayshaun McGann, Glademire Mendoza, Trey Muse, Paxton Pomykal, Justin Rennicks, Brandon Servania, Stanley and Carson Vom Steeg. At the 2017 Development Academy at Winter Showcase, a handful of U-17 World Cup vets returned to play with their club teams in the first big tournament of the 2017-18 Academy Season. The U-20 MNT roster includes goalkeeper Eric Lopez, who was part of the USA's 2015 FIFA U-17 World Cup team. Of the two major U-17 tournaments in 2017, 11 YNT summit players made both rosters: Justin Garces, Christopher Gloster, Jaylin Lindsey, James Sands, Akil Watts, Taylor Booth, Chris Durkin, Blaine Ferri, Chris Goslin, Ayo Akinola, Andrew Carleton. Zyen Jones was called into the qualifying team, while Alex Budnik and Sergiño Dest made the trip to India for the FIFA U-17 World Cup. Goalkeeper Brady Scott is the only player called in that was part of the USA's 2017 FIFA U-20 World roster. Nineteen players are currently playing for international clubs: Jonathan Amon (FC Nordsjaelland), Michael Baragan (Atlas FC), Shaft Brewer (RB Leipzig), Justin Butler (FC Bayern Munich), Gedion Davis (JMG Association Barcelona), Nick DeFreitas-Hansen (Everton), Sergino Dest (Ajax), Jalen Hawkins (FC Bayern Munich), Ian Hoffman (Karlsuher SC), Owen Otasowie (Wolverhampton Wanderers FC), Brian Perez (Club Tijuana), Nebiyou Perry (AIK Fotboll), Joshua Pynadath (AFC Ajax), Stuart Ritchie (FC Groningen), Brady Scott (FC Köln), Lawson Sunderland (Levante UD), Juan Pablo Torres (K.S.C. Lokeren Oost-Vlaanderen), Angel Uribe (Club Tijuana) and Will Vint (Manchester United). A total of 73 players from the five USA rosters represent Academy or Professional clubs from Major League Soccer. Born in 2000, five players called up to the U-20 roster (birth year 1999) are playing one year above their natural age group (U-19): Andrew Carleton, Chris Durkin, Chris Goslin, Jaylin Lindsay and James Sands.